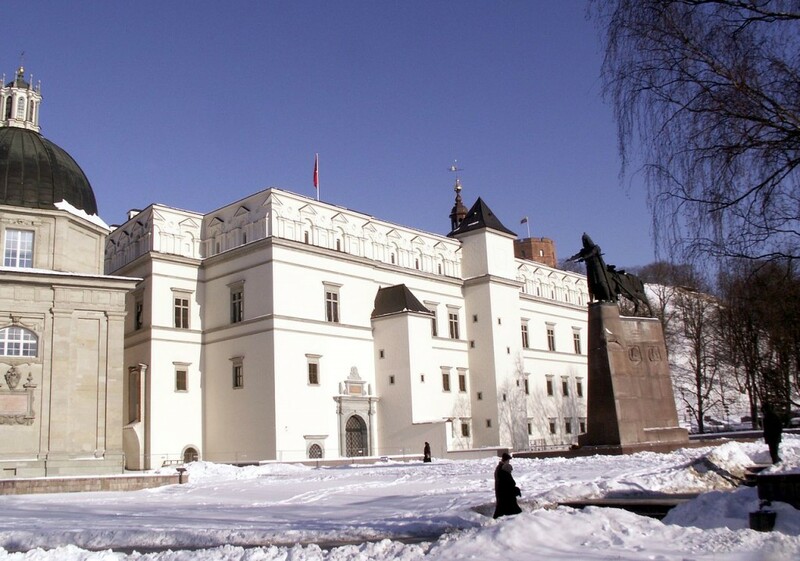 The Palace of the Grand Dukes (Lithuanian: Lietuvos Didžiosios Kunigaikštystės valdovų rūmai) was originally constructed in the 15th century for the rulers of the Grand Duchy of Lithuania. 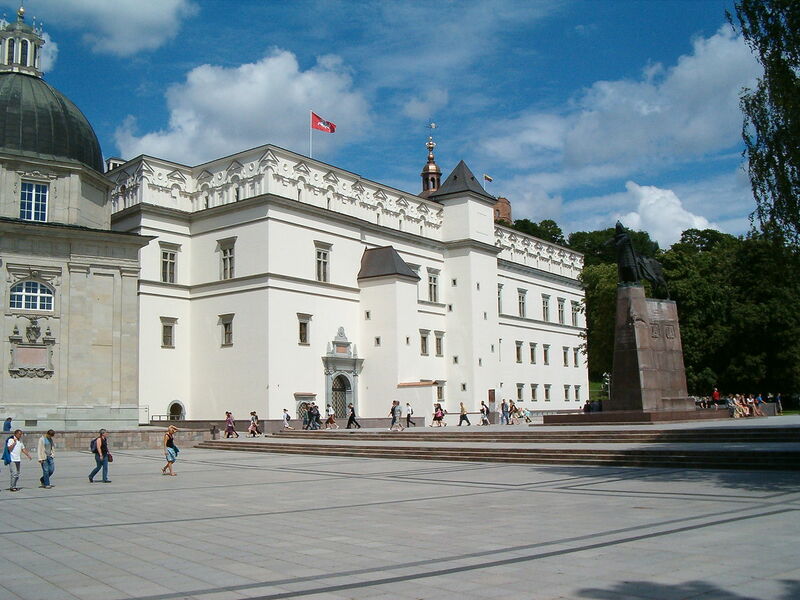 The palace, located in the lower castle of Vilnius, evolved over the years and prospered during the 16th and mid-17th centuries. Four centuries, the palace was the political, administrative and cultural centre of the Grand Duchy and then Polish-Lithuanian Commonwealth. In the 13th and 14th centuries, there were stone structures within the palace site. The stone palace was built in the 15th century, apparently after a major fire in 1419. The palace was built in Gothic style. The Gothic palace had three wings; research suggests that it was a two-story building with a basement. Grand Duke Alexander Jagiellon, who later became King of Poland, renovated palace and moved here his residence. After his marriage to a daughter of Moscow’s Grand Duke Ivan III, the royal couple lived and died in there. Sigismund I the Old, after his ascension to the grand ducal throne, conducted his affairs in the palace as well as in Vilnius Cathedral. During the rule of Sigismund I, the palace was greatly expanded to meet the new needs of the grand duke. Another wing was added, as well as a third floor, and the gardens were extended. The palace reconstruction plan was probably prepared by the Italian architect Bartolomeo Berrecci da Pontassieve, who also designed several other projects in the Kingdom of Poland. Sigismund’s son Sigismund II Augustus was crowned Grand Duke of Lithuania in the palace. Sigismund II carried on with the development work and lived there with his first wife Elisabeth of Austria, daughter of Ferdinand I, Holy Roman Emperor. Sigismund II’s second wife, Barbora Radvilaitė (Barbara Radziwill), also lived in the palace. According to contemporary accounts of the Holy See’s emissary, the palace at that time contained more treasures than the Vatican. Sigismund II also assembled one of the largest collection of books and tapestries in Europe. The palace was remodelled in the Renaissance style in the 16th century. The plan was prepared by several Italian architects, including Giovanni Cini da Siena and Bernardino de Gianotis Zanobi. The palace was visited by Ippolito Aldobrandini, who later became Pope Clement VIII. 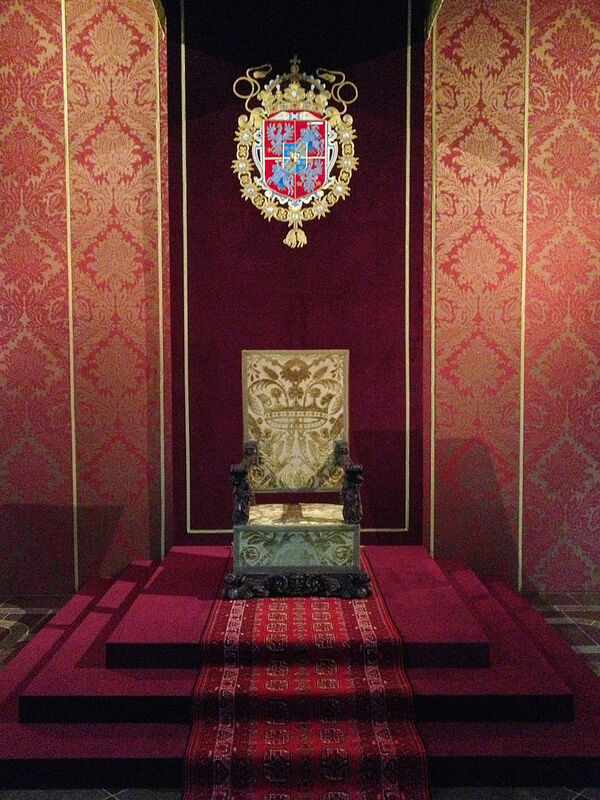 Another major development took place during the reign of the House of Vasa. 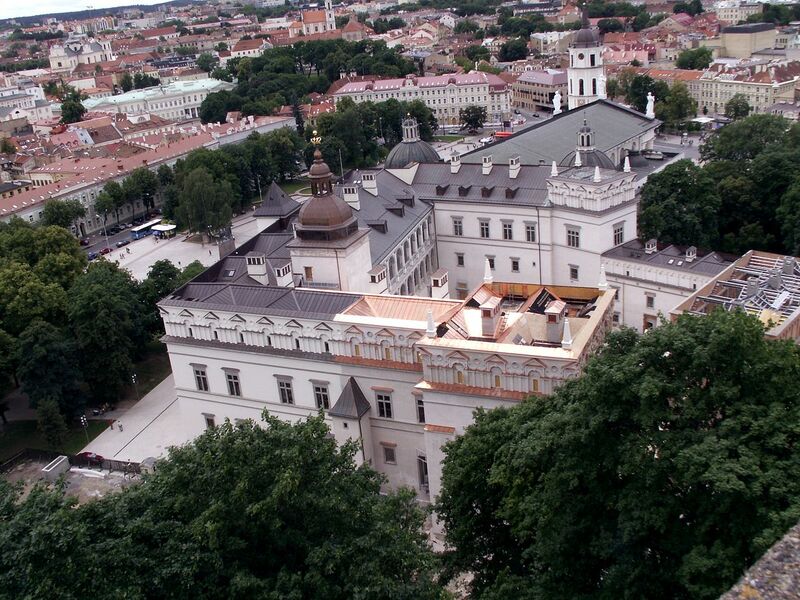 The palace was refurbished in the early Baroque style during the rule of Sigismund III. Matteo Castello, Giacopo Tencalla, and other artists participated in the 17th-century renovation. During the Vasa rule, several notable ceremonies took place, including the wedding of Duke John, who later became King John III of Sweden, and Sigismund Augustus’ sister Catherine. The first opera in Grand Duchy was staged in the palace in 1634. Marco Scacchi and Virgilio Puccitelli were the opera’s impresarios. After the Russian invasion in 1655, the state began to weaken, and that also affected the castle. In August 1655, the Muscovite army captured Vilnius. The army of Commonwealth recaptured the city six years later, but the palace was greatly damaged and its treasures were plundered. 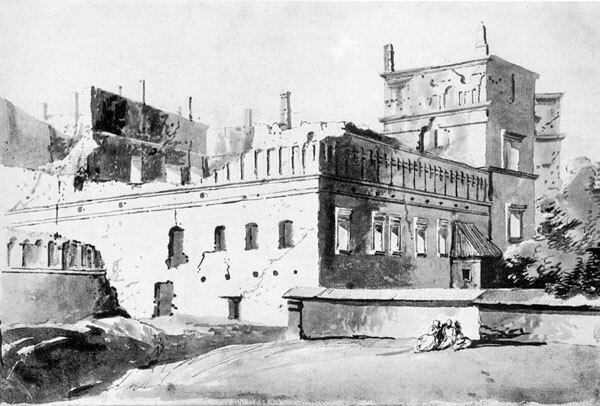 After the recapture of the city of Vilnius in 1660–1661, the palace was no longer a suitable state residence, and stood abandoned for about 150 years. In the late 18th century, after the fall of the Polish-Lithuanian Commonwealth, several families lived in parts of the ruined palace. Soon after the Grand Duchy of Lithuania was incorporated into Tsarist Russia, officials ordered the demolition of the remaining sections of the palace. The structure was almost completely demolished in 1801, the bricks and stones were sold, and the site was bowered. Only a small portion of the walls up to the second floor survived, that were sold to the Jewish merchant Abraham Schlossberg around 1800, who incorporated them into his house. 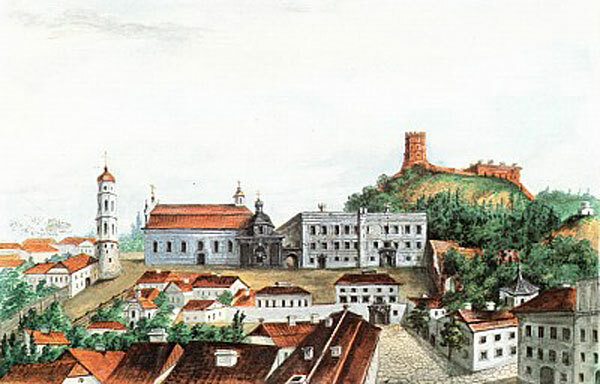 After the November Uprising of 1831, the czarist government expelled Schlossberg and took over the building, as it was building a fortress beside it. After Lithuania regained its independence following World War I in 1918, the castle became the headquarters of the army. It soon was captured by the Polish troops following the Polish annexation of Vilnius (Wilno). During World War II, it was the office of the German Wehrmacht, and after World War II it was used by Soviet security structures and later transformed into a Pioneers Palace. After the fall of the iron curtain in 1989, Lithuania became independent again. 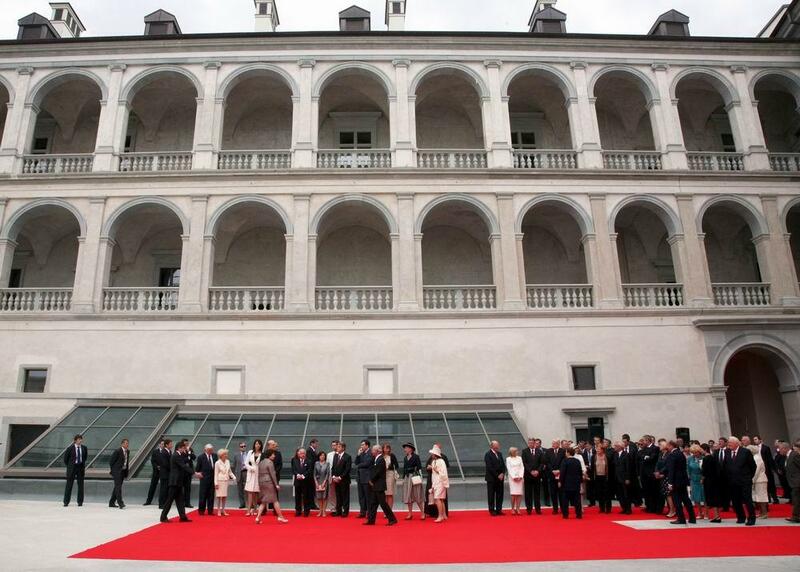 As part of a program of nation building, the government decided to reconstruct the palace. The project received approval after archaeological digs, various studies and controversial discussions. Ground was broken in 2002 on the site of the original building. Fragments of Schlossberg’s house became part of the eastern wing of the restored palace. The building was opened during the celebration of the millennium of the name of Lithuania in 2009.